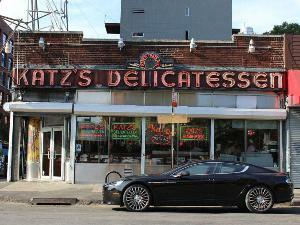 Aston-Martin is no stranger to the production of fashion-forward four-door automobiles. The Lagonda, for example, was in production for 16 years, ending the Me Decade with a flourish of canted angles and upright sophistication. Fans have had to wait longer than the Lagonda's entire run in order to once again sample a sport sedan from the storied marque, but as the 2014 Aston Martin Rapide S proves (the latest and greatest version of the model that first debuted in 2010), it's been time well spent. 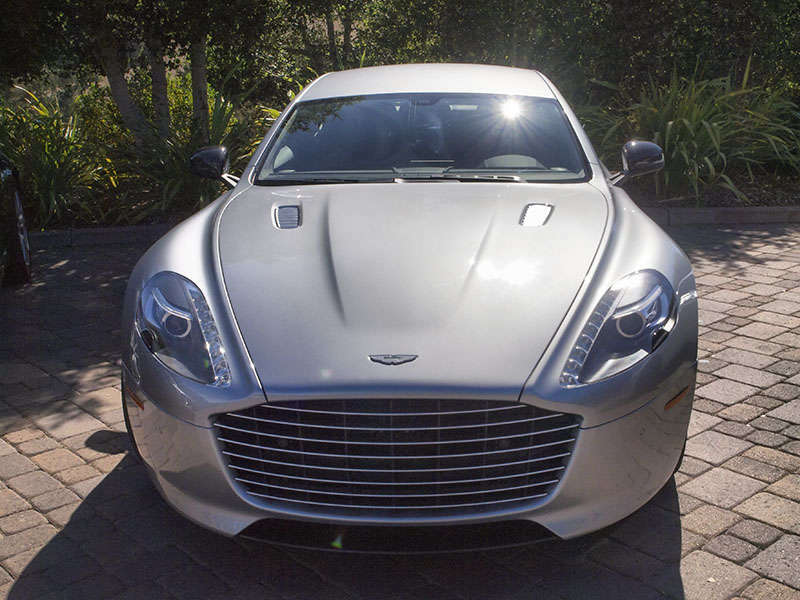 The 2014 Aston Martin Rapide S is a gorgeous coming together of glass, metal, and all manner of exotic composite materials, shaped to resemble Aston Martin's fleet of two-door grand touring cars as much as possible. In fact, it's only the additional length of the Rapide S' footprint that gives it away as a sloped-roof sedan - that and the thin line sweeping up in front of the rear fender well that indicates where the second set of doors cut into the vehicle's exquisite form. Seen from either the front or the rear, the Aston Martin Rapide S maintains the same aggressive, yet high class image that has helped create one of the most visually pleasing automobile lineups on the market. It's perhaps not fair to judge the interior of the Rapide S based on the expectations engendered by its first impression, but someone has to do it. While the idea of a four-door sports sedan/coupe is one that has become almost de rigueur for ultra-premium car companies, executing this type of design with practicality in mind is a more difficult task than sketching out an eye-catching concept. There are a few things that stick out when adapting to the 2014 Aston Martin Rapide S' passenger compartment configuration. The fact that the doors have to be opened up-and-away from each of the four seating positions to preserve curb clearance instantly acquaints you with the lack of mechanical advantage offered by the car's low seating position. The back seat is also somewhat tight in terms of both leg and shoulder room, with the vehicle's full-length center console contributing to a closed-off sensation that is otherwise alleviated by the open cargo area immediately behind the rear buckets. Finally, although the materials used throughout the cabin are top notch, the layout of the Aston Martin's features and controls is a little too pedestrian for this class of vehicle, and I found the lit-glass buttons used to shift the transmission into Drive (as well as access the vehicle's various performance settings) to be a bit of an affectation. All was forgotten, however, once I pushed one of the dashboard's little glass buttons to activate Sport mode and then held down on another glass button until the car's stability control system was set to Track mode. 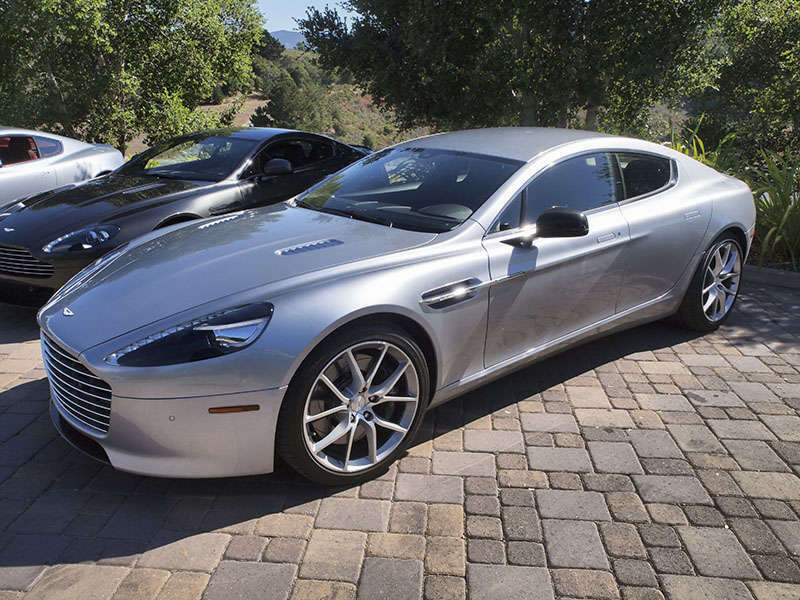 Armed for fun, I hit the throttle on the 2014 Aston Martin Rapide S' 550 horsepower, 12-cylinder engine (80 ponies more potent than the original Rapide) and surged out onto the tight, hilly roads that tunnel through the landscape surrounding Monterey, California. The 2014 Aston Martin Rapide S certainly lives up to its name in a straight line, capable of reaching 60-mph from a standing start in 4.7 seconds on its way to a top speed of 190-mph. 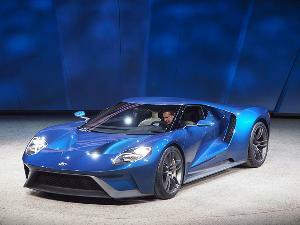 The 5.9-liter V-12 under the car's long, suggestive hood pumps out 457 lb-ft of torque, which is delivered not all at once but rather in the form of a steadily building onslaught of forward momentum that can be checked only by apply one's foot on the car's brake. The snarl emerging from Rapide S' exhaust tips was exhilarating, making it exceedingly satisfying to drop a couple of gears using the paddle mechanisms on its steering column and hear the engine blip and burble its willingness to adhere to the slightest input. 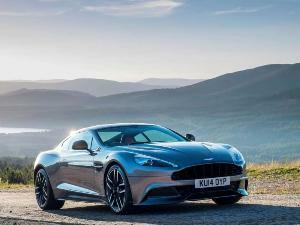 All this despite the Aston Martin being outfitted with a standard torque converter-equipped six-speed automatic instead of a more modern dual-clutch unit. 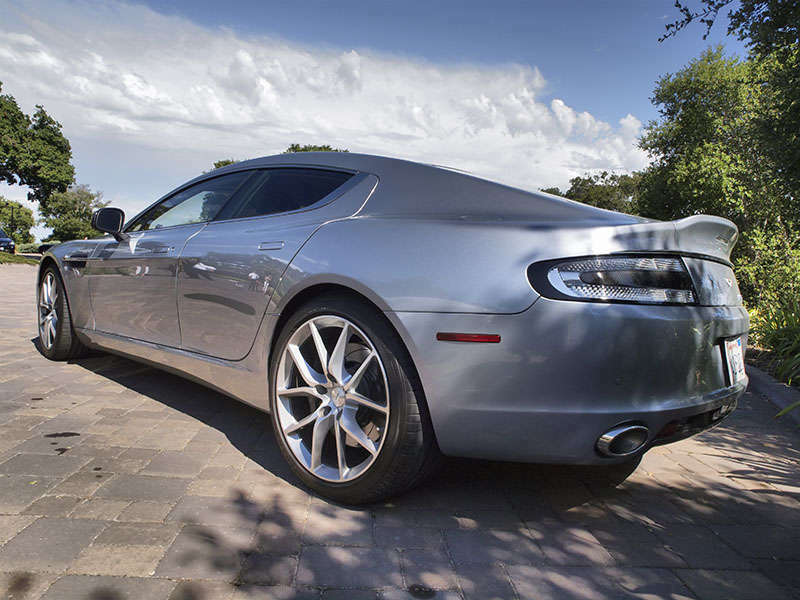 The Rapide S' prowess in the curves is much more surprising, especially given its total mass of over 4,300 lbs. Somehow, Aston Martin's engineers have found a way to give the Rapide S a driving experience that magically replicates the sensation of driving a car half its weight and perhaps three-quarters its size, as it ate up the narrow, off-camber lanes I encountered at a high rate of speed with an excellent degree of stability that never once had me whitening my knuckles on its elegant, leather-wrapped wheel. 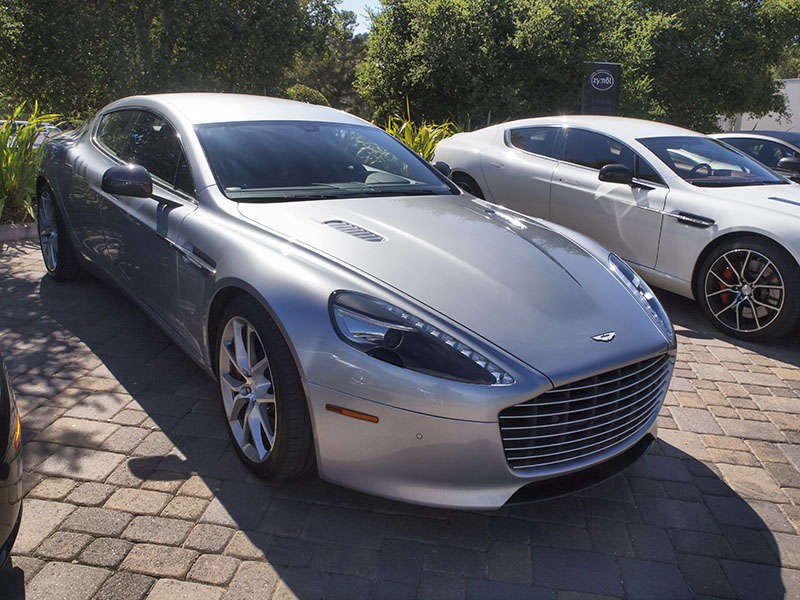 The best part about the exceptionally sharp suspension system and drool-inducing soundtrack offered by the 2014 Aston Martin Rapide S is that you can turn them both off when it's time to make a more civilized run to the local country club. 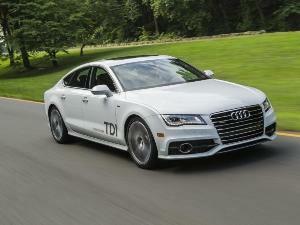 Although the car is automatically set to Sport mode when first turned on - a nice touch that more automakers should emulate - pushing the button once will transform the car's ride into a refined and comfortable one suitable for long-distance travel. The dual personalities of the Aston Martin Rapide S are to be celebrated, as the automobile is equally capable of satisfying both the Dr. Jekyll and Mr. Hyde locked up inside us all - all while looking every penny of its $202,775 starting price.